We’ve touched on Aluminum Metal Matrix Composite (MMC) material benefits for lightweight applications – you can catch up here. 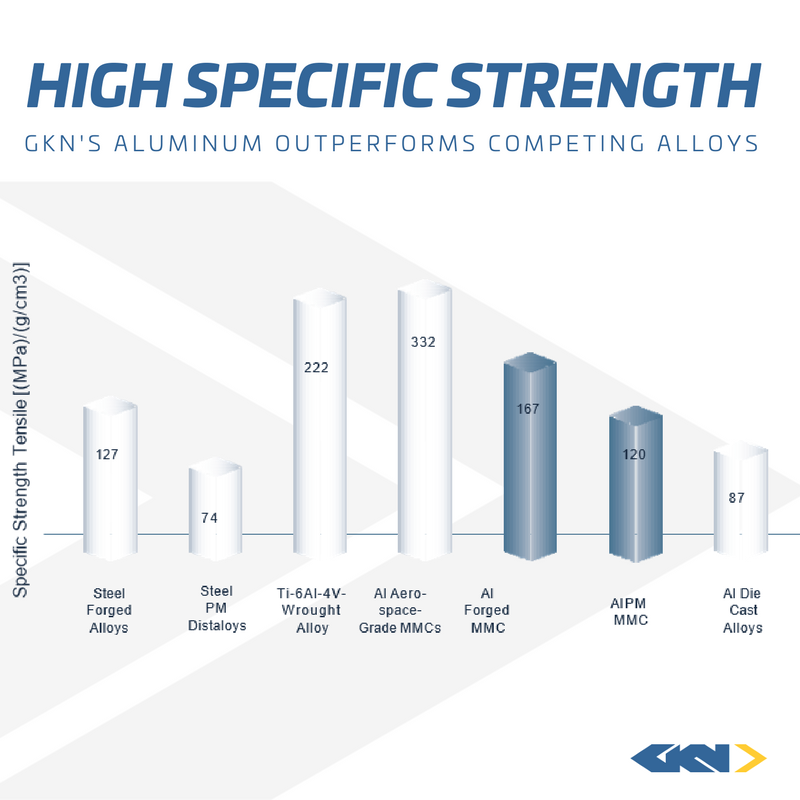 These GKN aluminum alloys create unmatched efficiency savings through its high wear resistance and enhanced elevated temperature mechanical properties. We sat down with Rich to discuss how he and GKN’s Lightweight Technology team developed a material that set GKN as the first company to commercially produce powder metal (compact-sinter-size) Aluminum MMCs in the automotive market. First, what is an Aluminum MMC and why is it unique? Aluminum MMCs are an Aluminum material that is reinforced with ultra-fine ceramic particles to provide enhanced strength and wear resistance. Other enhancements include a lowering of the thermal expansion and increasing the stiffness of the material, bringing it closer to steel – a mating component. The ceramic portion of the Aluminum MMC material can be introduced two ways: traditionally as an ultra-fine ceramic addition to the raw material blend, or by generating the ceramic during the production process (during atomization and/or sintering). This process is much finer and typically Nano-sized. Aluminum MMCs give a customer the advantage of Aluminum’s lightweight characteristics and stability, and the enhanced wear resistance of ceramic. Other composites have been widely used in the past for desired properties and weight reduction in advanced aerospace, sporting goods, automotive and advance structures, but at a cost which made them prohibitive for standard automotive applications. 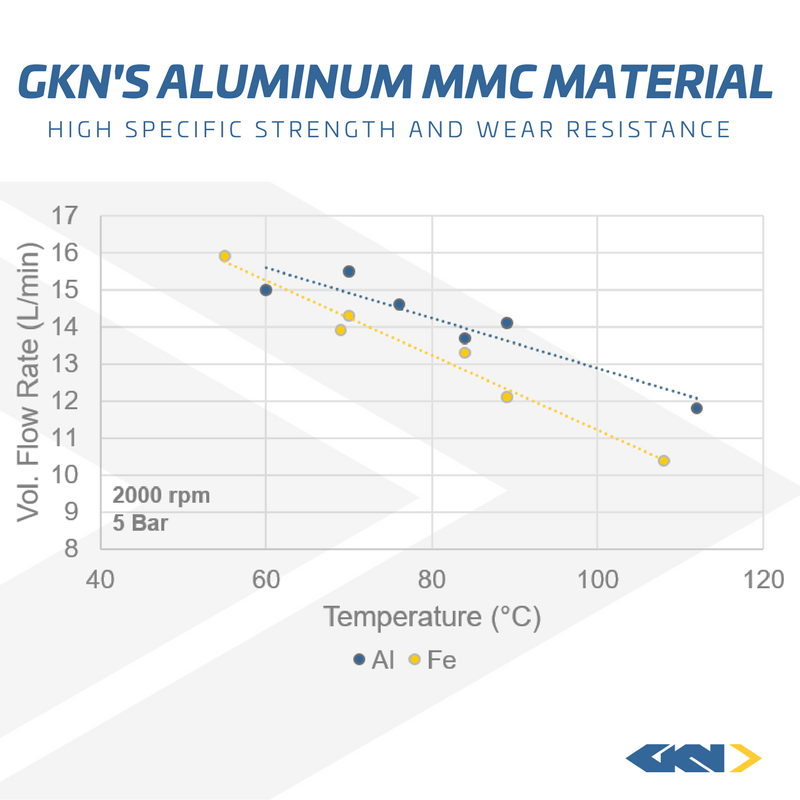 GKN has created an economical MMC material that uses our standard PM compaction-sinter-size processes to provide final parts at a substantially lower cost than typical aerospace Aluminum MMC systems. What applications will benefit the most from Aluminum MMCs? Products that will benefit most from MMCs are ones that need to be lightweight due to CO2 regulations, which typically means lighter than steel. These products also need to have a strong wear resistance against their mating components (products like Camshaft Caps or One Way Clutch plates), or a strong wear resistance against themselves (like Pump Gear sets). Other components that benefit from MMCs will require enhanced strength and/or fatigue at elevated temperatures (like Connecting Rods, Gears, Pulleys and Pistons). Basic aluminum material has a weak fatigue limit and will only survive to a specific lifetime. While steel has a higher fatigue limit, this can only be achieved up to a certain load limit. Combining ceramic and aluminum significantly increases a product’s fatigue life. How does the MMC material compare to traditional steel or iron? Compared to iron or steel, the MMC material is lighter (2.7 – 2.75 g/cc vs. 6.8 – 7.2 g/cc), and comparable in strength and wear resistance to lower-end sintered steel systems. The material also offers similar specific strength to moderately strengthened sintered steels, so weight reduction is typically possible without sacrificing performance. Does this technology come at a cost? If yes, why is it worth it? The cost depends on the application, but will typically be slightly higher than the cost of a steel component. However, the Aluminum MMC’s ability to reduce a system’s weight allows features like increased performance, improved efficiency, or various targets to be met with the lowest possible weight and cost. The right markets need to be educated on this technology’s opportunities. The appropriate applications for Aluminum MMCs have wear issues and fatigue problems. These problems can only be solved by powder metal technology and our Aluminum MMC material. What can we expect from GKN and MMCs in the future? GKN is now looking at other processing technologies such as sinter forging for items like Connecting Rods, Pistons, Gears and Pulleys. We are also applying Aluminum MMCs to Additive Manufacturing processes, like Laser Melting and Binder Jetting, to take full advantage of the material’s properties and weight savings capabilities. Aluminum MMC AM systems can offer improved performance, more than the typical Aluminum AM materials, so be on the lookout for those opportunities. How about receiving updates right to your inbox?